Six wheel racing cars attracted tremendous attention and interests towards the end of the 1970s. The theory of the 6 wheel March was that on conventional racing cars the large wheels at the back of the car disturb the airflow around the rear of the car and create 'drag'. However, to reduce them in size would mean less tyre surface in contact with the track and a corresponding reduction in road holding and car control. March did reduce the wheels in size and compensated for loss in tyre surface by having four rear wheels instead of two! 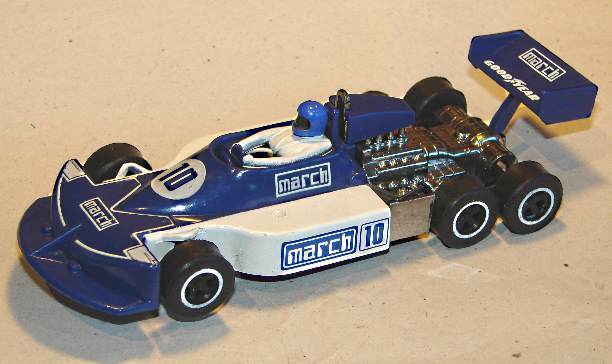 This very sought after model of the Scalextric C129 March Ford 771 model is complete. Thoroughly cleaned and serviced this Scalextric C129 March Ford 771 model is fitted with new pick up braids and six new tyres. The car has been track tested and runs extremely well with quiet smooth motor and gears. The front and rear wing mouldings are complete. The tyres are in good, grippy condition with no cracks or other damage. The body has no scratches and the factory applied printing is in good condition. 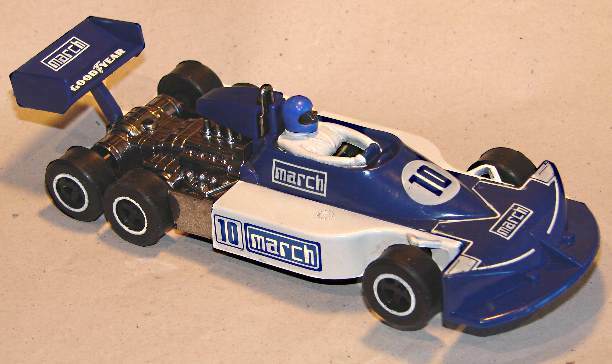 This Scalextric March Ford 771 car is wonderful to race and would add value to any collection.